Info "Volcanic rocks are flying! Avoid the rocks if you want to rock and roll!" Pompeii Back is a microgame in the Strange folder in WarioWare, Inc.: Mega Microgame$! The name of this microgame comes from Pompeii, an ancient Roman city which was destroyed by a volcano, Mount Vesuvius. There is an erupting volcano on the left side of the screen, and a man in the middle. The volcano spurts a large rock. 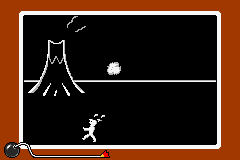 The player must use the to control the man, keeping him from getting hit by the bouncing rock until time runs out. The rock will never hit the player at the start of the game, so the player should not move until the rock starts bouncing. 1st level difficulty: The rock is smaller than the man. 2nd level difficulty: The rock is around the man's size. 3rd level difficulty: The rock is bigger than the man. This page was last edited on April 2, 2019, at 21:57.